This zine is dedicated to articles about the fantasy role-playing game Gods & Monsters, and other random musings. See my earlier article, Silver sail and gold, above a dappled sea, for non-numerical details on the politics and excitement of driftwood ships in the space above Highland. The summary is that ships ride the gravity flow with driftwood. They catch the solar wind with sailcloth. The first step in building a driftwood ship is acquiring the driftwood. Driftwood blocks the gravitational attraction of large bodies, thus making it possible to not fall back to a planet in a spectacular crash. Driftwood grows in rocky, cold environments with thin atmospheres. It grows best on Mars, but can also be grown on high mountaintops on Earth or similar planets. Driftwood should be cured before use. Uncured driftwood reduces maneuverability by 5. Each year of curing reduces that penalty by 1, up to a maximum of five years curing on-planet. Driftwood can be cured more quickly or more efficiently in space. Driftwood cured in space reduces the maneuverability penalty by 1.5 per year, to a maximum of 7—that is, ships made from driftwood cured for five years in space will have +2 maneuverability. Space is big. It is very easy to lose track of curing stacks when curing in space. After curing, the wood should be coated with a varnish of wood resin to preserve the cure. The best resin is driftwood resin. This provides a +1 to maneuverability. Other wood resins do not affect maneuverability, and non-wood mineral oils reduce maneuverability by 1, while tar oils reduce maneuverability by 2. Without varnish, the wood may become infected and eaten away by insects or other creatures. Unlike driftwood, which grows best on Mars but can grow in other places, the sailmoth only produces thread on Mars, and only in the Martian highlands. The cost of sailcloth depends on the time of year it is produced. Normally, sailcloth costs 10 monetary units per square yard. Sailcloth only affects maneuverability when sailing in space. On a planet, sailcloth acts like any other sailing material. Sailing in space beyond the immediate area of a planet, silver, gold, or mithril woven into the sailcloth vastly reduces the time spend traveling. Silver sailcloth costs 100 monetary units per square yard. Gold costs 1,000 monetary units per square yard. Mithril costs 10,000 monetary units per square yard. None of these affect the ship’s maneuverability, only its warp speed. Driftwood ships can sail using normal cloth sails to catch the wind. But only sailcloth can sail against solar winds. 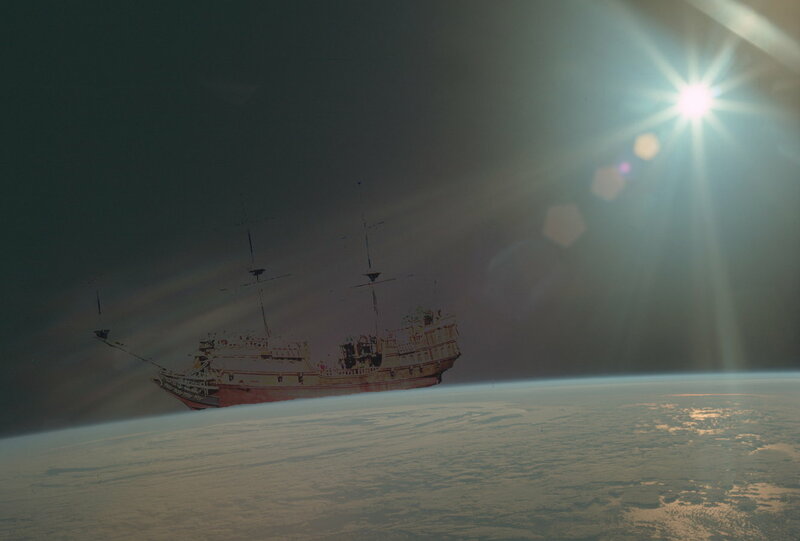 A driftwood ship caught in space without sailcloth is dead in the water. Sailcloth, however, provides no benefit over normal sail within a planet’s atmosphere. A sailing ship on planet, on water, is able to move at its movement multiplied by the windspeed, divided by 10, in miles per hour. Thus, extremely fast ships could theoretically go at twice the speed of the wind, but this is not common using medieval designs. In most locales the windspeed will vary daily between zero and the maximum windspeed. Windspeed on earth, over the ocean, is about 15 miles per hour average. A good daily average is 2d16–2 miles per hour. Storms or incoming storms, of course, can increase this. On land, the average windspeed is about seven miles per hour. A good daily average is 2d8–2 miles per hour, and again, extreme weather conditions can increase this. Moving a hundred yards into the air and higher, the average windspeed is 20 miles per hour over the ocean and 10 miles per hour over land. A good daily average would be 2d20–2 over the ocean and 2d10–2 over land. In combat or otherwise moving short distances in space, sailcloth allows a driftwood ship to fly movement miles per hour. Sailcloth ships also have a warp speed which is the speed they travel when going directly to a faraway destination rather than trying to maneuver in small areas. It is only attainable outside of a planetary atmosphere in straight lines or very wide curves. When sailing within a planetary system, such as between the earth and the moon, cloth sail warp speeds are movement times 1000 miles per day. This means it will take about half a month to fly from the earth to the moon on a movement 10 sailboat. Silver sail warp speeds are movement times 10000 miles per day. Gold sail warp speeds are movement times 20000 miles per day. Mithril sail warp speeds are movement times 40000 miles per day. Within a solar system, such as between Earth and Mars, warp speeds are multiplied by 200, and in galactic systems—between solar systems—warp speed is multiplied by 200,000. Hitting anything at warp speed is like hitting an iceberg—even hitting an air pocket is dangerous. These sargassos are often filled with wrecks and adventure. A ship’s maneuverability ranges from 1 to 20, though the higher end is extremely rare. Normal maneuverability is in the 8 to 10 range. Each point is 3 degrees of free movement under normal conditions. Trying to turn at more than that requires a maneuverability roll. Failure means stalling; a big failure means the ship’s maneuverability is reduced until repaired. Maneuverability is the ship’s equivalent of agility. A captain’s agility modifies their ship’s maneuverability as a minor contributor. Their charisma modifies the ship’s maneuverability as a major contributor. Tonnage can be converted to passenger space at 1 ton per passenger. The sail cost is not included in the cost of the ship. Normal, non-sailcloth sails cost one monetary unit per square yard. The caravel is the stereotypical sailing ship of the high seas. Those ships you see in pirate movies are probably caravels. When you see an old pirate ship or war ship outfitted with high walls and cannons, it is probably a carrack. The Spanish galleon was an improvement on the carrack, modifying the cargo ship to double as a warship. The galley can be propelled by oars on sea and in the air. Its second movement, maneuverability, and crew size are while under oar power. Driftwood ships must be kept clean. If barnacles, water, dirt, or anything else collects on the driftwood hull, they are subject to gravity, and will either slow the ship considerably, or potentially even drag the ship down to crash on a planet or planetoid. If a driftwood hull is breached, the ship is likely to start sinking towards the nearest large body, because its contents are now exposed to that body’s gravity. Cost to maintain a driftwood ship is 10% of the ship’s original cost, per year, including the cost of the sails. Repairing driftwood ships costs 100 monetary units per survival point, adjusted by the driftwood adjustments used in building the ship, if any. A great ship carries its own air with it. This air lasts for survival times ten days, divided by the number of people on board. After this, or if a character goes into space without a ship, they must rely on the thinner atmosphere of the void. The air atop a mountain is thin; the air in space is even thinner. Actions in space, when relying on void air only, are normally at a penalty of four. This can vary to zero in sargassos and as high as ten in thin-air bubbles. Bubbles of no air also exist, but there the normal suffocation rules apply. Every endurance days that a character is in space and relying on void air, the player must make a health roll or the character becomes spacesick. Spacesickness requires that the character sleep at least sixteen hours a day, and all penalties—from void air or from anything else—are doubled as the character is light-headed and dizzy. In response to Silver sail and gold, above a dappled sea: The lands of Mars, Venus, and beyond, where strange creatures dwell in vast oases of floating vinous balls. Space is a cross between Lovecraft’s Dreamlands and Burroughs’ Martian adventures. Within the outer reaches of the world, ships of driftwood and sailcloth ride the solar winds. This combination of westerns and Star Trek is a fun series to watch, as long as you don’t take it too seriously. This movie completes the Firefly story. It works on its own, but I recommend watching the series first. The lands of Mars, Venus, and beyond, where strange creatures dwell in vast oases of floating vinous balls. Space is a cross between Lovecraft’s Dreamlands and Burroughs’ Martian adventures. Within the outer reaches of the world, ships of driftwood and sailcloth ride the solar winds. Sailing the high seas last modified November 11th, 2015.